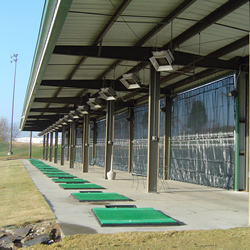 Fairways and Greens Golf Center – Practice Made Perfect. Have fun while improving your game. At Fairways and Greens, our shared love of golf drives who we are and what we do. Our team of instructors, club fitters, and course maintenance professionals are dedicated to providing an unparalleled experience to East Tennessee golfers looking to improve their game. Recognized as a top 50 stand-alone range by the Golf Range Association of America, Fairways and Greens has a core mission extending far beyond game improvement. We’re also committed to the fun and social elements of golf — a commitment we’ve realized through our new Toptracer lounge, the only one of its kind in East Tennessee. Located on 25 acres in West Knoxville, Fairways and Greens is the South’s premier golf practice, instructional, club fitting, social gathering and entertainment facility. The center operates year-round as a membership-based facility. However, out of town guests are welcome for a daily fee. We also welcome the general public (non-members) for golf lessons, club fitting and use of our fantastic Toptracer Range. Whether you are a beginner or a skilled player, the facility has something for you in order to take your game to the next level. Fill out the below form we’ll reach out with more information! The outdoor practice range features three immense Bermuda grass tees as well as a separate teaching tee for individual or group golf instruction. The entire hitting range is lighted for late evening practice. Year-round, members enjoy the benefit of hitting unlimited premium quality practice balls from natural grass practice tees. The teeing grounds are complete with Adirondack chairs, numerous club cleaners and precise distance markers to nine strategically positioned range target greens. The covered practice tee area is the ideal spot for members to avoid the summer-time heat and winter-time chill. This practice area consists of eighteen artificial surface hitting stations equipped with individual gas heaters, as well as precise yardage signs to range target greens. Toptracer Range is a state of the art golf tracking technology as seen in televised professional golf events. The system displays shot shape, captures and displays ball flight data, as well as provides fun skills games and virtual golf on simulated courses. 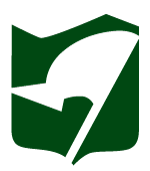 The system offers many different options in terms of player experience. As a Fairways and Greens member, you have access to some of the most manicured putting surfaces available. Built to USGA specifications, the two outdoor Crenshaw Bentgrass greens offer the very best conditions for developing a consistent, repetitive putting stroke. The “Loop” course consists of three Bentgrass greens tightly nested around a pond with each hole utilizing three separate tees to create a challenging nine-hole layout. The holes range from 80 – 160 yards in length. 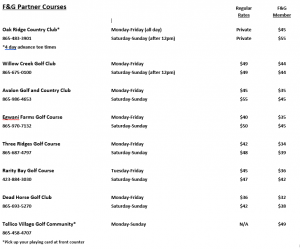 The short course provides the perfect opportunity to develop course management skills by adapting to multiple club selections and hazardous conditions. Fairways and Greens proves its commitment to year-round player improvement by offering a 10,000 square foot indoor practice and learning center. Get a golf specific work out done by our Titleist Performance Institute instructors. 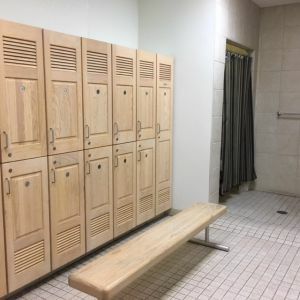 Whether you’re dropping in for a quick workout during your lunch break or squeezing a practice session in on the way home from work, utilize our men’s and women’s locker rooms. Our locker rooms are clean and provide a convenient, secure way to store your possessions. In addition, we offer showers with all the basic accessories to make sure you’re ready to return home or to work. Whether you’re a beginner or a seasoned player, our membership packages will take your golf game to the next level.